During World War I, due to a shortage of M1911 pistols, the Army procured Colt New Service and Smith & Wesson hand ejector cal. 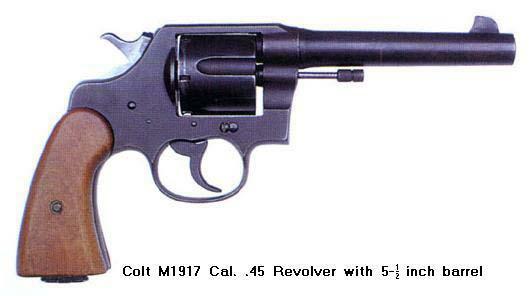 .45 six-round double-action revolvers. These pistols were standard issue until World War II, when they were only issued to Military Police and security personnel. Both pistols used the same rimless .45 cal. cartridge as the M1911/M1911A1 pistol (305,000).